1979 Trolls Royce, Royce Rod, Troll Rolls!! “The car is famed in song and story!! Corbin Goodwin built it, Jay Leno Drove it, Matt Farrah drove it, Youtube has the vids!! This car is one of the most recognized vehicles on youtube and has more than 1,000,000 views!! The caris outrageous, famous, and a blast to drive!! Corbin Goodwin took a lowly 1979 Rolls-Royce Silver Shadow II and extensively modified the car in the manner that he is famous for. The car was originally sold by Beverly Hills Rolls Royce, and had owners in California and Las Vegas before being purchased by the Corbin approx 5 years ago. The build is a follow-up to the seller’s RX-7 project, which was widely documented on /DRIVE and other venues. Since completion, the car has been driven around 1,200 miles and was featured on Leno’s Garage, One Take and Vehicle Virgins. Corbin turbocharged the 6.75-liter V8 and installed a T-19 4-speed manual transmission. Additional modifications include a large bumper-mounted intercooler, welded rear differential, trunk-mounted radiator, 19? Porsche Panamera wheels, and much more. Approximately $20k was spent on parts and fabrication, which included adding a custom flywheel from AASCO in Anaheim, California, King off-road coilover shocks, a 20-gallon fuel cell, and a custom exhaust from Deeds Performance in Chatsworth. Given the modifications, the car drives extremely well (check out the videos!! ); all of the components work surprisingly well together. The exterior appearance of the car has been extensively modified. Prominent coolant lines running from the trunk-mounted radiator OVER THE ROOF of the car (hand warmers anyone?). The hood and grille have been cut to make way for turbo plumbing, and a large intercooler is mounted in place of the front bumper. A 20-gallon fuel cell and unique rear fender flares can be seen here. The exhaust pipe exits the passenger-side front fender, and a large side scoop directs air over the trunk-mounted radiator. 19? Porsche Panamera alloys wear Continental tires measuring 255/40 in front and 295/40 out back. The the wheels retain the same rolling diameter as the stock Rolls Royce wheel/tire combo. The dash has been fitted with an aircraft boost gauge, Fox Mustang tachometer, and a speed conversion chart based on transmission gearing and engine rpm. Gears are selected with the poseable mannequin (!!) shift lever seen above. A/C equipment has been removed, but the seller states that the heater could be returned to operational condition. A Boss 100W amp powers door-mounted Alpine speakers. The odometer was said to have shown around 55k miles at the time of its removal. Sparco racing buckets replace the stock front seats. The original red leather rear bench seat has been retained, and the windows switches and parking brake remain functional. The trunk houses the battery and a CSF radiator sized for a Mk3 Toyota Supra, with stainless coolant lines running the length of the car. Also seen above are the fuel filler and an external hydraulic fluid reservoir for the King coilover shocks. The 6.75-liter V8 has been fitted with a twin-scroll Bullseye Power turbocharger, as well as a Synapse blow-off valve and wastegate. A Holley 750 cfm carburetor tuned by CSU Carburetors is adapted to the stock intake manifold with a custom Delga Prototypes adapter and a ProCharge inlet hat. Power is sent to the rear wheels through a welded rear differential and a T-19 4-speed manual transmission with a Ford Mustang clutch. The motor runs well and produces good power and torque. A Wilwood 7/8? master cylinder replaces the stock component, and Orme Bros. stainless brake lines have been fitted throughout. 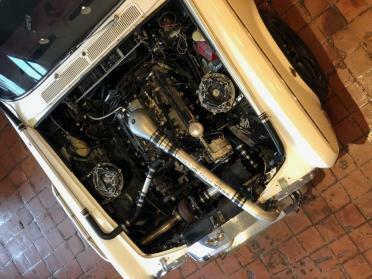 The stock Silver Shadow employs a double-wishbone setup up front, and custom-spec King coilover shocks were selected to accommodate the lengthy suspension travel. Porterfield front brake pads were installed. A video seen below features driving footage with Matt Farah from The Smoking Tire and an explanation of build details by the builder. This car draws a crowd wherever it goes, and is blast to drive.